Mauritania is a 3,5 million people country, officially the Islamic Republic of Mauritania, is an Arab Maghreb country in West Africa. It is bordered by the Atlantic Ocean in the west, by Western Sahara in the north, by Algeria in the northeast, by Mali in the east and southeast, and by Senegal in the southwest. The capital city is Nouakchott. Mauritania domains are easy to get, it is a country where You can make a reservation for a domain name, but You need to buy it, You have one year to do so. 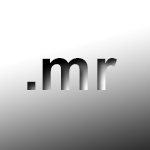 If You want to buy domain name .mr You need to select one of the topics listed in the form. The length of Mauritanian domains must be at least 3 characters long but only up to 12.